In the late 1990s, we regularly heard two predictions about the print and mail industry: first – hard copy mail would decline by 50% by the year 2010, and second – color would replace black & white printing of transactional documents. As discussed in an earlier blog, mail volumes have declined, but not to the extent many experts predicted. Hard copy mail remains a vital component of customer communication. And the shift to color print in production mail? We’re getting closer to that prediction, with more documents being printed with color images and text. The shift to a greater use in color has been driven by technology and pricing. The explosion of the World Wide Web increased the use of color in communications. There were no additional expenses for adding a color logo or chart on a web page or email. Companies, and their customers, now expect more than just gray scales when displaying images or information. Desktop inkjet printers lent momentum to the shift. While few users calculate the costs, presentations and reports are generated in color for external and internal use. Copier vendors now provide multifunction devices that include color options. 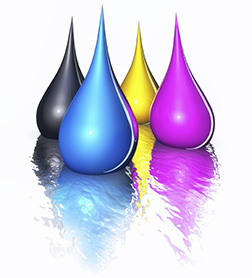 In the production environment, the capabilities and performance of inkjet printers have significantly improved. For many transactional documents, it’s difficult to tell which were printed on a toner-based or inkjet machine. Variable color ink-heads, including MICR ink, combined with post-print add-ons like perforating units, allow companies to use one paper stock for multiple print jobs. This significantly lowers the per-piece costs for documents. Ink and toner-based equipment providers have responded with machines that calculate the percentage of color used on the page. Instead of paying one price for a color “click”, users pay variable pricing depending upon coverage. The same machine can be used for transactional and on-demand printing at reduced costs. Like most technology shifts, larger organizations benefit most from these changes. But mid-sized and smaller shops should be planning their move to color in the immediate future. The lack of a strategy to meet the rising demand for color printing will result in lost business. For an in-plant shop, that means outsourcing. For a service provider, it could mean closing your doors. Color transactional printing isn’t about what’s going to happen tomorrow. It’s about what’s happening right now.